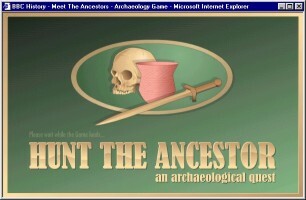 BBC Archaeology and Ancient History, Hunt the Ancestor game. Available: http://www.bbc.co.uk/history/games/ancestors/index.shtml. Requires Flash 4 plug-in or above. 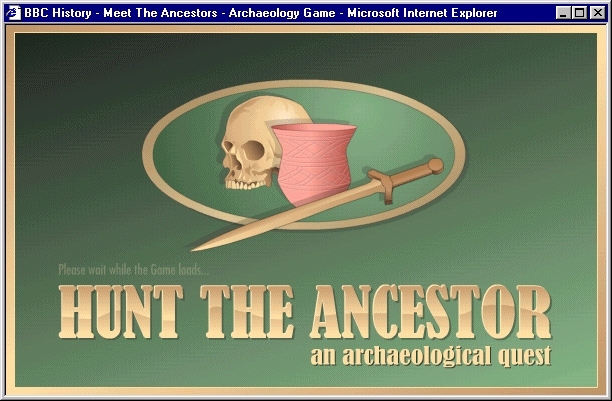 Anyone familiar with the BBC's long-running television series 'Meet the Ancestors' will recognise much of the format for the online game 'Hunt the Ancestor'. The site is based around a fictional rescue excavation in Greenshire; its aims are to recover a prehistoric burial under threat of destruction by a quarry. Despite the fact that the intention is to excavate human remains and produce the eponymous reconstructed human face at the end (and is it just me or do these always look just about the same? 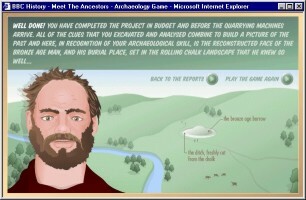 ), it introduces the user to some important archaeological concepts. 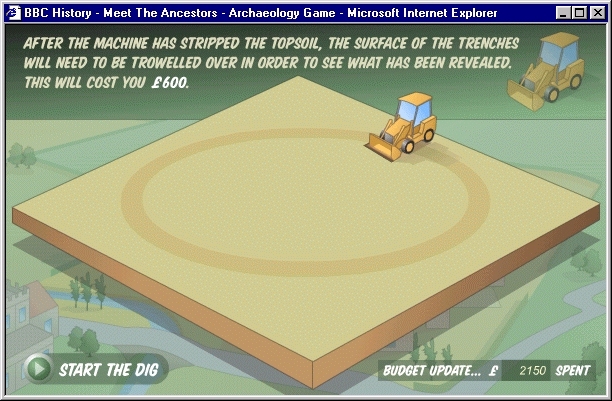 Something missing so frequently in media coverage of archaeology is the question of money, but anyone playing this game starts with a fixed budget and must keep within its constraints or otherwise be forced to restart the game. 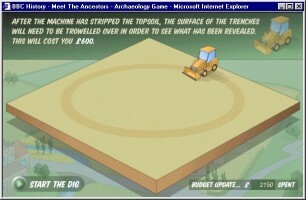 As with modern archaeology units, developer-funding here enables desktop research, fieldwork and post-excavation. One immediately faces a choice — does one go to the local records office or should one simply employ the local flying club to take aerial photographs of the site (a true luxury of riches for any unit!). Having made a decision to make a decent desktop study for a change, I was presented with maps, diary entries and an SMR index card all with their own neat flash animations. There is also the option to take aerial photographs should one wish, with a plane noisily crossing your monitor! Following the acquisition of all this information, the user can take a more detailed look at the site, employing geophysical survey should they wish in an attempt to locate any trenches correctly. Your next choice is whether to dig the whole site or simply sample it - more well-produced flash animations with a JCB at this point. Having selected an area, and provided that you are within budget, it is then time to excavate. 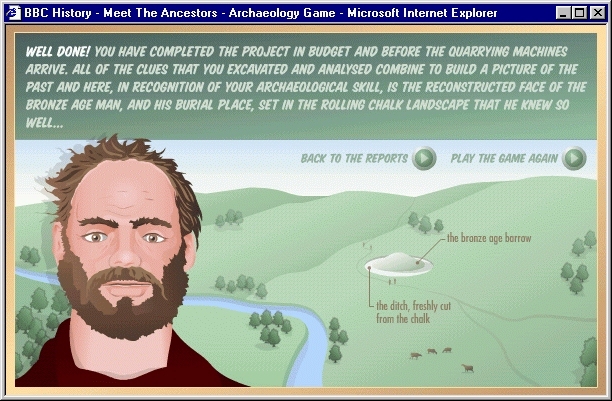 Having excavated under a plethora of site directors who used vastly differing excavation techniques, I was intrigued to know which modus operandi I was going to be able to choose for the excavation itself. Would I be able to whack on down with mattock, would I need to use more care and excavate all with trowel? In short which version of Techniques of archaeological excavation had the programmer used? Would it be Barker, Cunliffe, Time Team or a new, revolutionary, methodology! 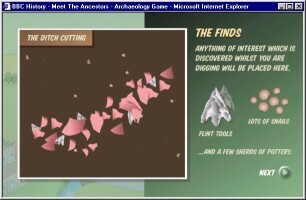 This being decided, the user moves through a series of screens to uncover the archaeological deposits, not without unexpected finds being made. As per the television series, it is encouraging to see the importance of environmental archaeology being brought to peoples' attention - it's not all bones and bronzes. As one would perhaps expect, following the digging it's time to purchase various specialist reports (perhaps the cost of these might have been given beforehand, which would have made for better budget management?) to produce a site report. If you've been successful, you can reconstruct the 'Ancestors' face and almost hear Julian Richards' voice giving the standard spiel about a landscape the ancestor knew so well that usually concludes the television programme. 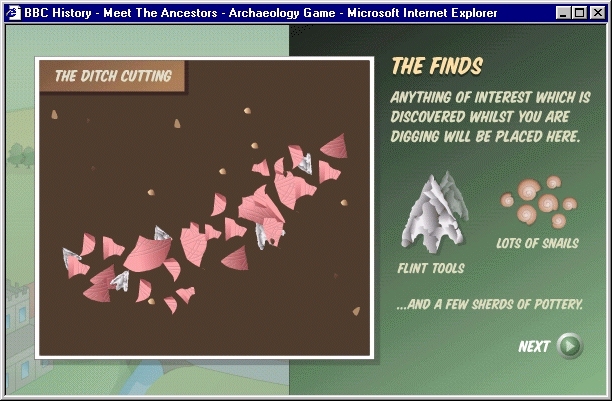 Overall, the site is excellent, introducing some important archaeological concepts to younger users as well as the fact that all the techniques cost money and one has to be selective in what one does. The graphics and animations are very crisp and far from over-fussy with many pleasing touches; ranging from traces of ridge and furrow in a field to moving shadows of the aircraft. 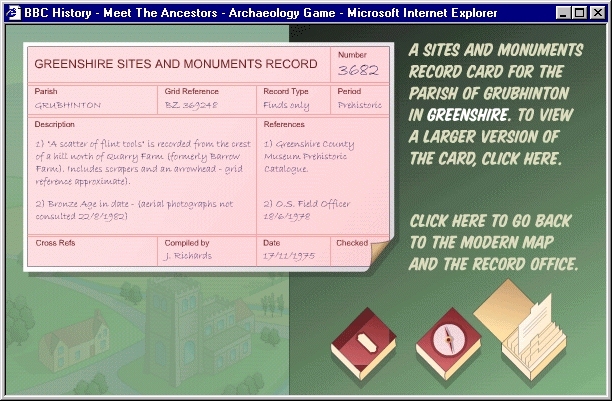 It is simple to use, provided one has downloaded Flash at some point (or made use of the link provided on this site) and seems well geared to children at Key Stage II level and above, or indeed anyone who, like me, has enjoyed 'Meet the Ancestors'.